These attributes, plus advantageous environmental and handling features, make ACZA-treated Douglas fir ideal for guardrail posts and rail blocks. It is also an economical choice; Douglas fir is a readily available species grown on managed timberlands in western states. 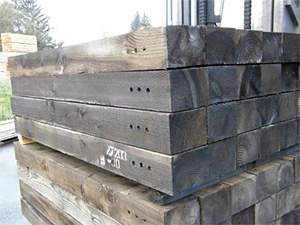 Conrad Forest Products, with three wood treating plants and expertise in the preservation of Douglas fir, produces guardrail posts under the “Chemonite” brand, a registered trademark of Arch Wood Protection, Inc., for ACZA-treated wood. Available from Conrad are 6x8, 8x8, and 10x10 posts, along with compatible blocks. Other sizes can be supplied on a special-order basis. All material complies with the standards of the American Wood Protection Association and thereby with AASHTO ME-133-10. Certifications by request. 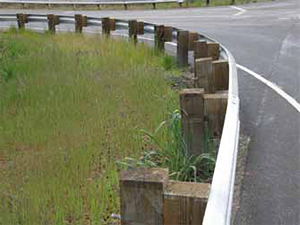 Chemonite guardrail posts share the many environmental attributes of wood itself – most notably: renewable resource, low-energy production, and carbon sequestration. The preservative process adds to these benefits by extending service life, thereby reducing demands on forests and reducing the need for shipping of replacement material. Chemonite posts does not necessitate unusual safety measures beyond those recommended for most other construction materials. These include: Wear gloves when handling, wear safety glasses and dust mask when drilling or sawing, and do not burn treated wood. State and local requirements vary, but, in general, lined landfills accept retired Chemonite posts and scraps in accordance with the same requirements that apply to other building materials. They can also be used as a fuel in approved co-generation facilities. Where questions exist, confirmation from the appropriate local authority is recommended.